As a winner of 11 GRAMMYs™ and a member of the Billboard™ Hall of Fame, Joan Sebastian is perhaps Mexico’s most famous and celebrated singer/songwriter with a career spanning 35 years and hundreds of songs. Joan draws strength and inspiration from a philosophy driven by three simple beliefs –Faith, Love and Luck. Now, Epiphone and Joan Sebastian unite to create a guitar that incorporates those three beliefs. 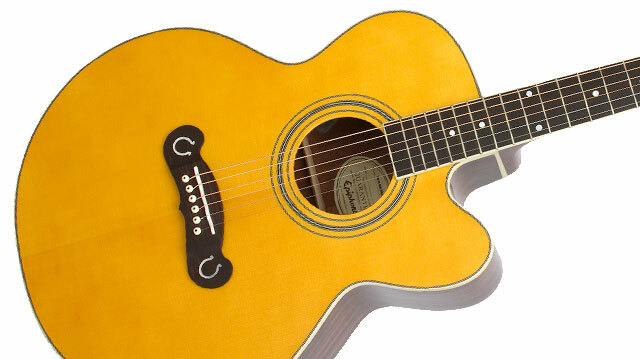 Presenting the new Joan Sebastian signature Soñador (the Dreamer) acoustic/electric guitar. From the moment you first see the distinctive pearloid inlays featuring the Cross (Faith), the Heart (Love) and the Horseshoe (Luck), you know the new Joan Sebastian Soñador is clearly an inspired guitar. Pick up the Soñador and start to play, and you'll immediately discover why this guitar is a dream come true. 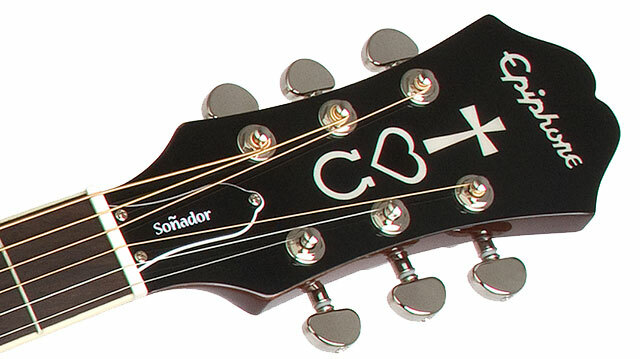 The Soñador is backed by Epiphone’s Limited Lifetime Warranty and the power of Gibson’s 24/7/365 day Customer Service. Make your dreams come true today with the the new Joan Sebastian Soñador. With a body shape inspired by Gibson’s famous J-185, the new Soñador is slightly smaller than a Super Jumbo guitar which makes it much more comfortable to play while still maintaining great acoustic power and projection. The Soñador produces a big sound with clear acoustics and is equally impressive for powerful strumming or delicate fingerpicking and everything in between. And, the Soñador's beautiful rounded cutaway not only gives it a distinctive look, but also allows for easy fret access up to the 20th fret. The rosewood bridge features a unique design reminiscent of the classic “King of the Cowboys” J-200 with pearloid "Horseshoe" designs on the bass and treble side. At the heart of all great guitars is quality wood and with an acoustic guitar, nothing contributes more to a guitar's tone than the top. That’s why the new Soñador features a solid Sitka Spruce top with hand-scalloped, lightweight bracing that will only improve with age. A solid mahogany neck is hand-fitted to the Soñador's mahogany body using a traditional dovetail neck joint and Titebond™ glue which provides maximum surface contact and strength. The result of this combination is a guitar with deep, rich lows and shimmering highs with just the right amount of mid-range. Top it all off with an elegant solid rosewood bridge with pearloid “horseshoe” inlays and you can see why the Soñador is a one-of-a-kind instrument. When you’re ready to perform live, so is the Soñador! The Soñador features the AT-3000 preamp which includes a Master Volume control as well as both High and Low EQ controls with a range of +/-12dB right at your fingertips. 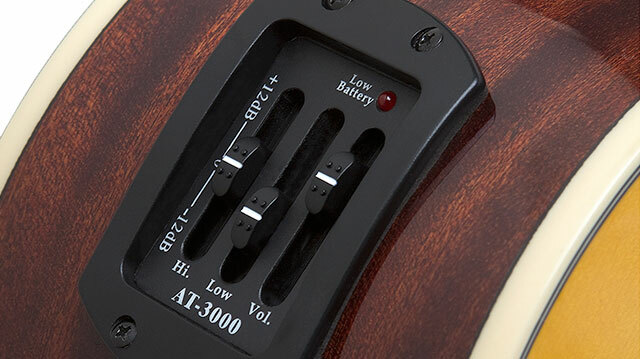 The AT-3000 preamp captured both body and string sound and is connected to a piezo element pickup mounted under a compensated saddle. Just plug-in using the combination 1/4" output/endpin jack and you’re ready to go live anytime, anywhere! The new Soñador is not only a beautiful instrument, but it's easy to play, too. The mahogany neck features Epiphone’s famous SlimTaper™ "D" profile for great picking speed and playing comfort. The 1.725” nut is slightly wider than most acoustic guitars and you'll find the wider string spacing allows you to finger notes more cleanly and is also perfect for fingerpicking. The Soñador also features a smooth, durable rosewood fingerboard fitted with 20 medium/jumbo frets with dot inlays for a classic look. Premium 14:1 die-cast machine heads provide excellent tuning accuracy and stability. And, Joan’s signature featured on the back of the headstock. Other premium touches include a multi-bound body on the top and back as well as a bound fingerboard.